I am bad about buying books and not reading them but when this one arrived, I immediately sat down to read it and I could not put it down! I read a little bit and then ran in the other room and gave Mike the short version of what it was saying. "You have to read this!" I said every time, and he agreed it was great information. The book is divided into sections, with each section having several contributors. 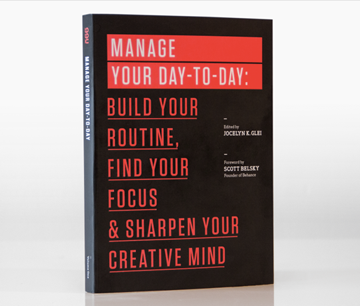 There are sections on Building a Rock Solid Routine, Finding Focus in a Distracted World, Taming Your Tools (this was my most needed section) and Sharpening Your Creative Mind. Those topics were exactly what I needed to recharge my creative business batteries! Yes!!! Turn your phone off Tracie. Shut the computer. Focus. I have taken the word "try" out of my vocabulary. 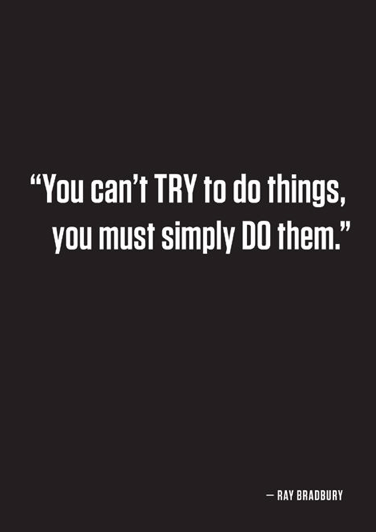 I'm not going to "try" to do things anymore - I'm doing them! 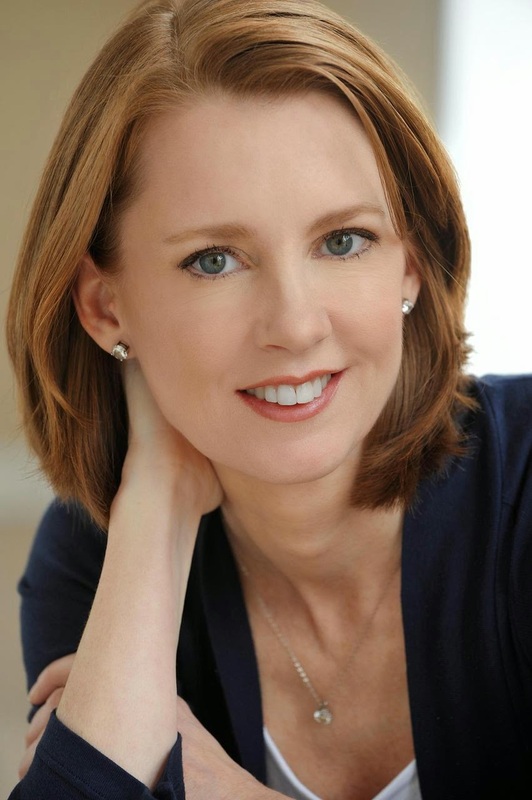 My favorite author, Gretchen Ruben of The Happiness Project contributes a chapter called, "Harnessing the Power of Frequency." I've often said "the more I create, the more creative I am." Gretchen agrees with me, saying, "When you work regularly, inspiration strikes regularly." She explains that a constant flow of creating keeps your flow going. One of my favorite features of the book is called "Key Takeaways" and it comes after each section. It's a synopsis of what you just read and it's exactly the notes I would have taken about key points I want to recall. A key takeaway from the second chapter is "Focus When You're Fresh." After reading it, I realized that on the days I am creating content (layouts, cards, blog posts, podcast material, videos, products to sell, classes), I must begin my day with creating before I ever look at the computer or clean the house. The first moment I wake up, while my mind is still fresh from rest, I must sit down at my desk and begin to create. I already knew that was something I needed to do but seeing it in black and white gave me permission to make it happen. Another key takeaway from chapter two is "Make Progress Visible" by keeping a journal or posting milestones. 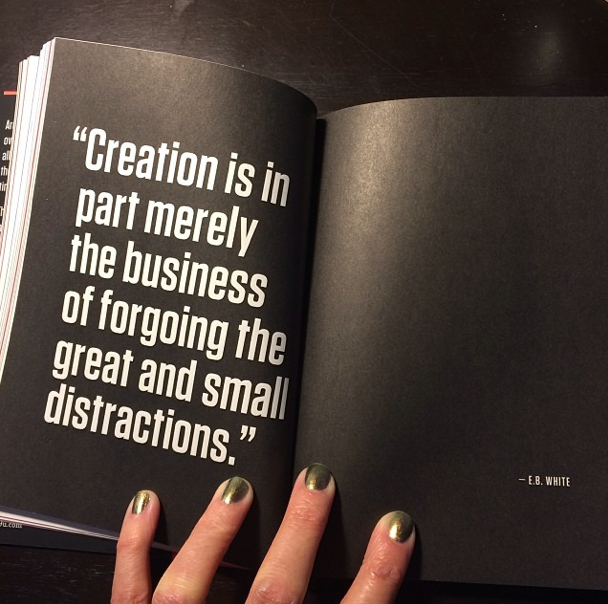 This is one reason I'm sharing my "Creative Goals Accomplished" list each month in my memory planner. Looking back at the month and seeing what I've accomplished helps fire me up to keep going strong. I've been really hearing this from a lot of sources lately. I've been saying NO to television and a lot of other things I used to waste time on and I've also decided it's okay to say NO to things people expect me to do. If they don't help me accomplish my goals, I must say NO. That isn't to say that I don't take time for what's important or that I never say yes, but I'm putting my days in order and making sure my life reflects my priorities. As another quote in the book says, "You can do anything....but not everything." I don't want to give away any more of the book because you need to read it! If you are in any kind of business or lifestyle that requires you to be disciplined, creative or focused...read this book! I'm getting ready to turn to page one and read it all over. I'm serious. It's so full of great information, I could barely process it all. There are other books in this series, I will be getting those too. It's such an easy read and so chock-full of information! I just highly enjoyed it. Is this blog post not for you? That's okay because another quote from the book that really resonated with me was, "A creator needs only one enthusiast to justify him." :) So true! 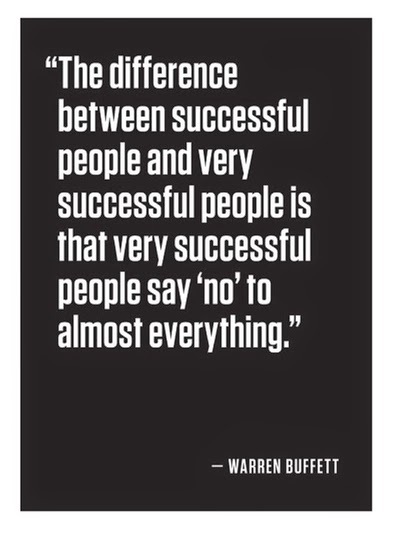 I love the Warren Buffett quote. So true!!! I will definitely need to put this on my list. You are so wise. I am definitely going to check this out. Thanks! wow! totally impressed. & curious. gonna put this book on my to read list.